I was recently inspired some great baseball illustrations and web design that I saw over at Dribble. 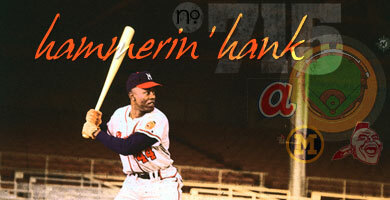 So I thought I might take a stab at putting together a little montage honoring the great Henry Aaron. 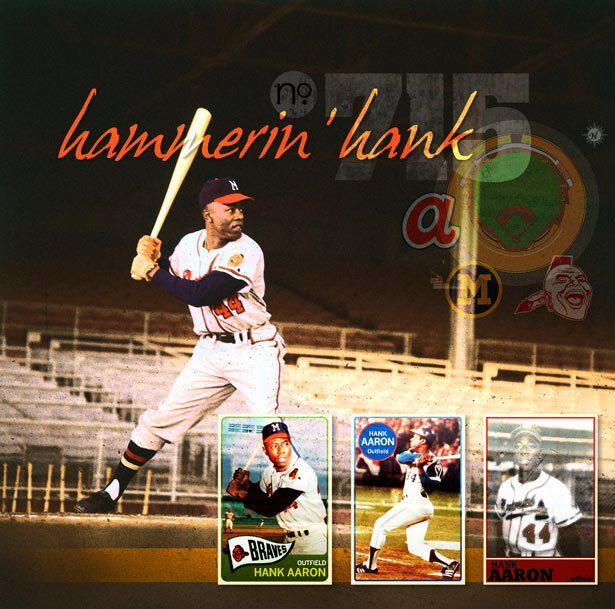 This one is entitled "hamerin' hank". I look forward to putting some other items together throughout the summer. Enjoy! 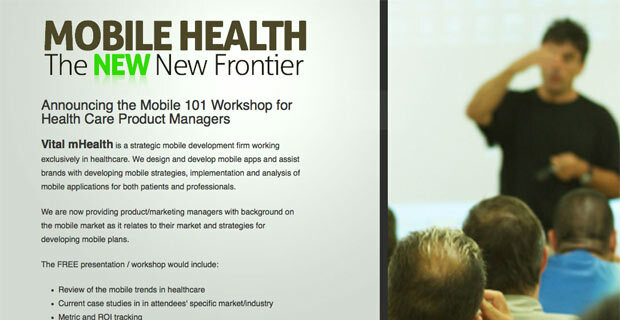 This landing page was designed and developed to support the iPhone App, PainMonitor that we developed at Vital mHealth. 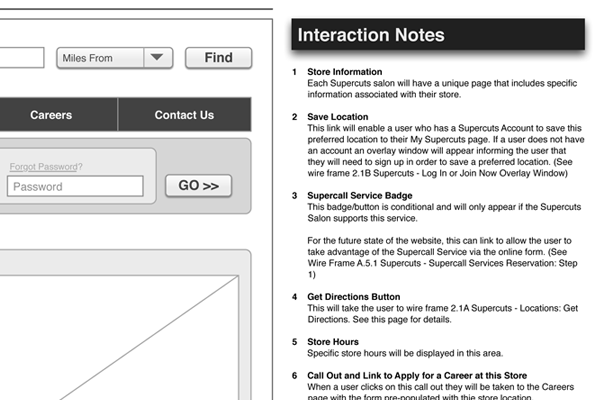 I played heavily off of the user interface and brand identity we developed for the app itself. When developing this landing page, I wanted to be sure that all facets of the app were represented along with a vehicle for customers to communicate with us. 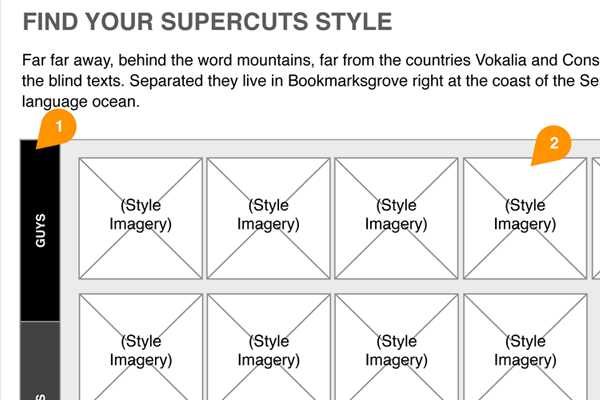 I also incorporated some jQuery scrolling scripts to display different screens of the interface. 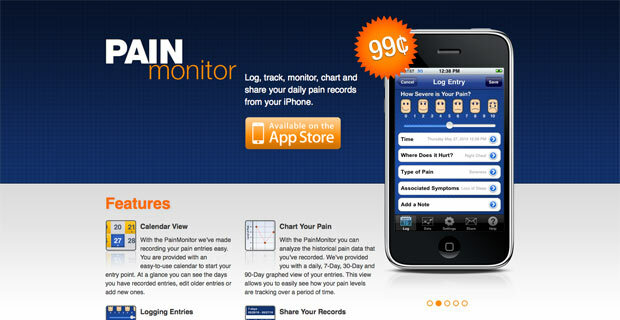 Check out the landing page in all of its glory and be sure to take a look at the PainMonitor App as well. 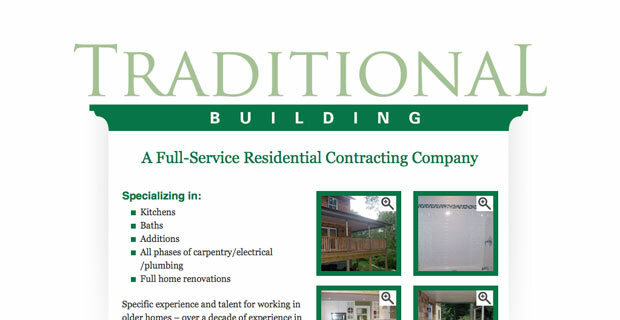 This site was developed for a friend of mine who owns a construction and home renovation company. 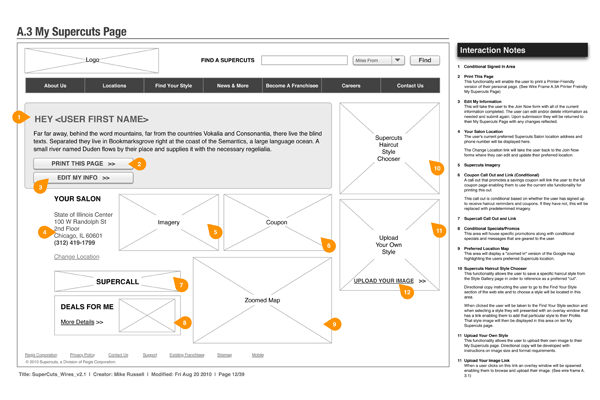 The design was based on the logo that had been developed for the company and is a simple one-page website. 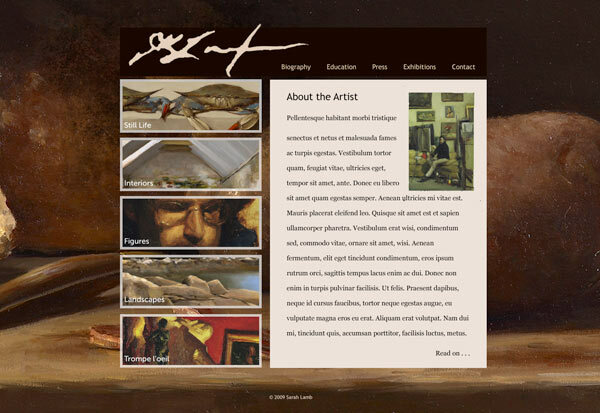 It uses a colorbox for displaying the recent work completed by his company. View the website. My latest company, Vital mHealth, is in the business of creating and developing mobile applications for the health care industry. Recognizing that this industry is never on the so called "cutting edge" of technology, we decided to create a Mobile 101 Presentation in order to educate our potential customer base. I developed this landing page that links from our website and allows the user to sign up if they are interested in learning more about the presentation. 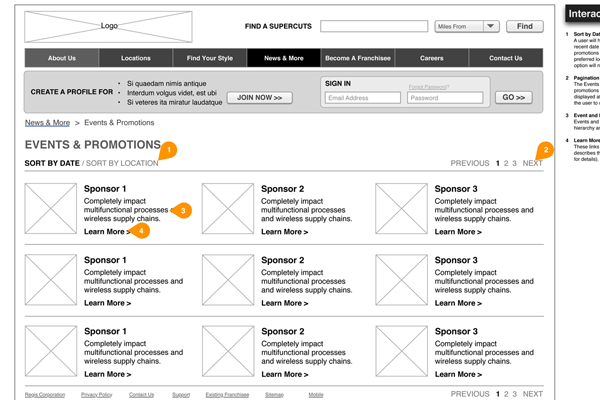 You can view the landing page here. 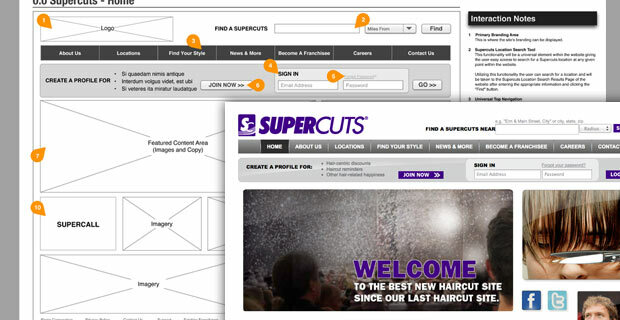 For this project Supercuts was in the midst of a website redesign. 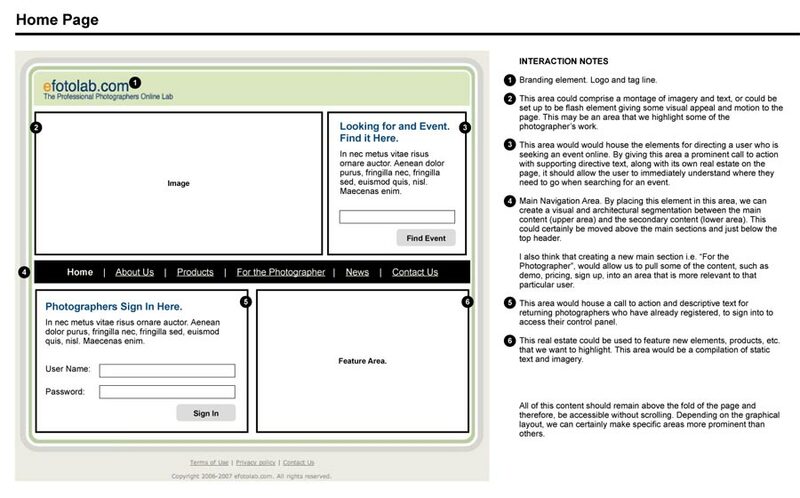 Working with an agency, I was charged with developing a new site architecture and developing a complete set of wire frames that detailed the newly revamped site and flows. 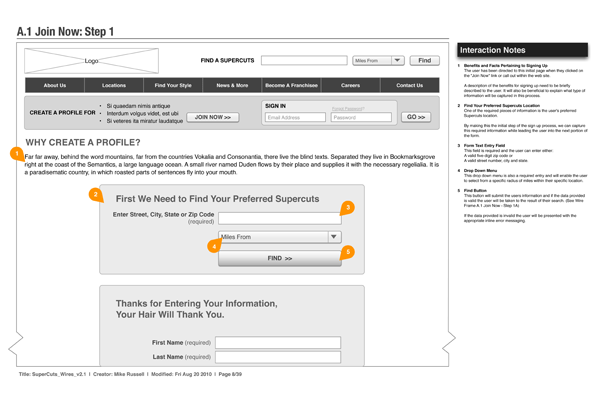 This included a new way for users to sign up and create their own 'My Supercuts' account that enabled them to save specific locations, sign up for deals and receive ongoing communications from Supercuts. It was a very collaborative assignment and was able to work with the designers and content developers to come up with the new structure. 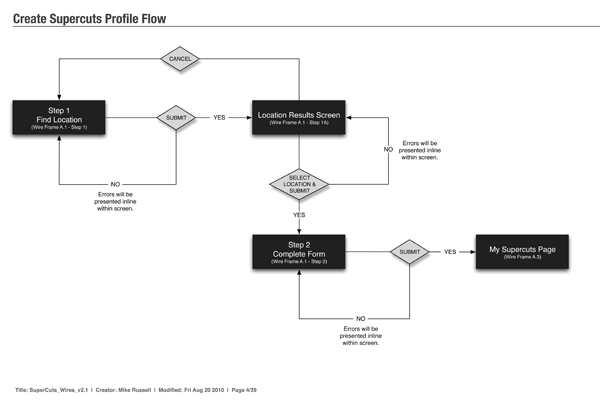 Here are some of the sample wires and flows along with the detailed interaction notes I provided. 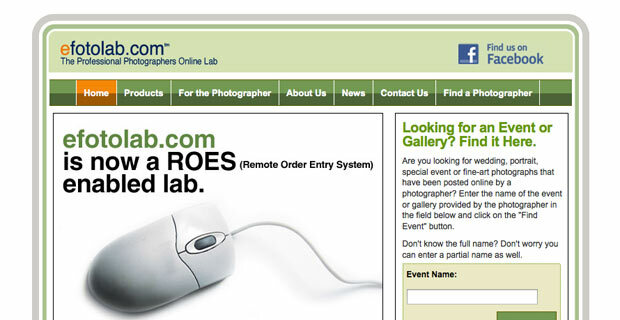 During my tenure at efotolab.com, I wore many hats. A couple of these included the creative and marketing responsibilities. 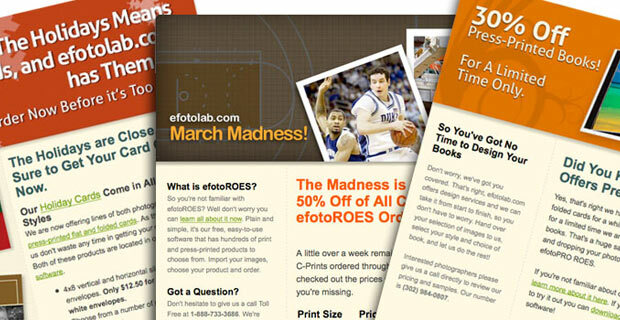 As an online commerce website with a limited marketing budget, email campaigns fit nicely into the fold. I was responsible for selecting a credible vendor. 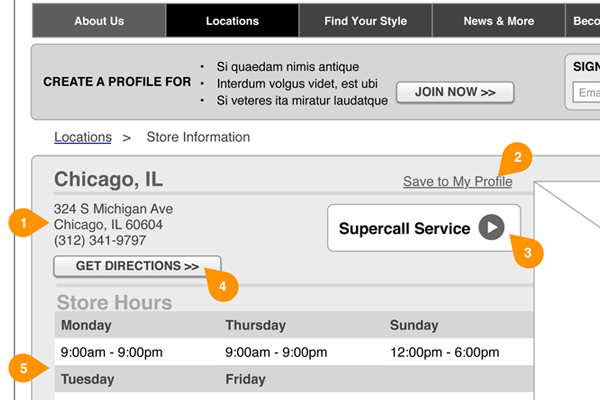 We went with MailChimp and I highly recommend them. 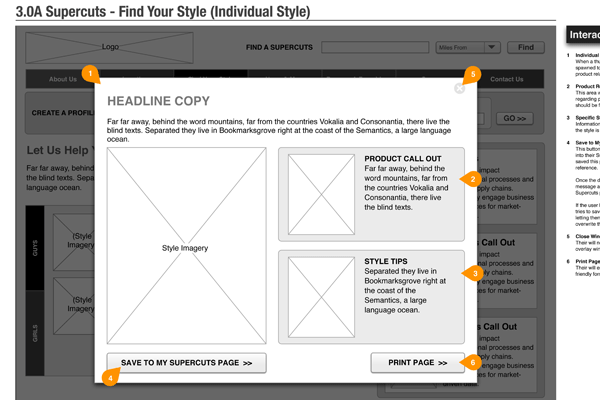 I was also responsible for creating the copy, design and overall development of a series of email campaigns we sent out to our customer base. These were highly successful and they continue to market in this fashion Here are some other designs and campaign emails that we also used. This site was in need of a home page make over and I was able to transition some of the original branding while giving the main page an updated navigation and page structure. I worked out the page structure in some simple wire frames to get the owner's buy in. I then converted the dated code to a reasonable 'XMHTL' structure and cleaned up the information hierarchy in the process. 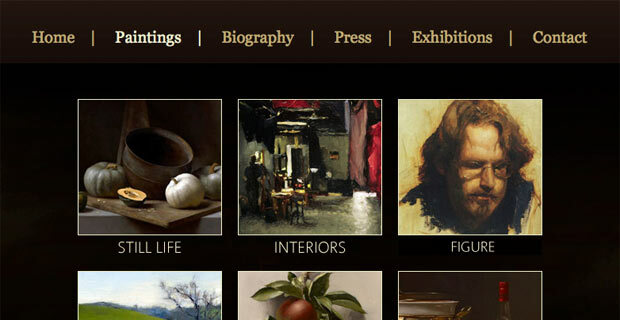 While I would love to redesign the entire site, it is a tall order and seems to always be on my "to do" list. 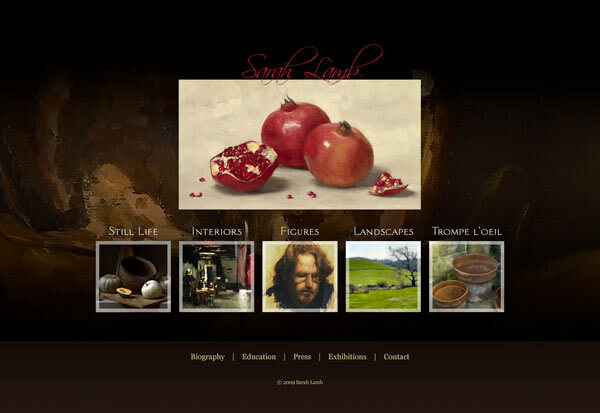 A local Pennsylvania fine artist asked me to design and develop a simple website that enabled her to display her current work. The goal for Sarah Lamb was to direct curators of art galleries around the world to her new site and allowed her to give them a 'Virtual Tour' of her paintings. She is now able to utilize the website to gain more visibility and enable galleries to assess her work for potential new shows. I was able to use her paintings as creative inspiration and incorporate this style into the overall design and architecture of the final website. 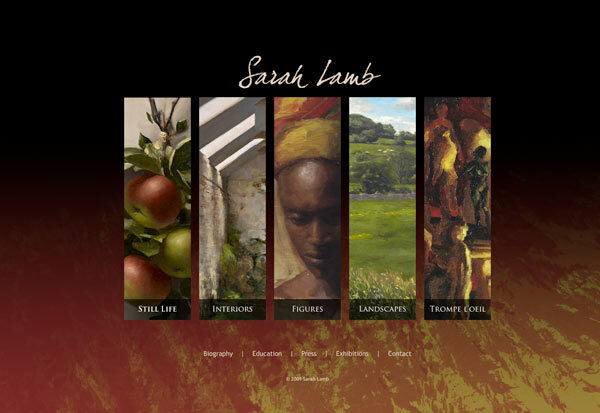 You can visit SarahLamb.net to view her beautiful work. Here are some alternate designs that were not chosen. 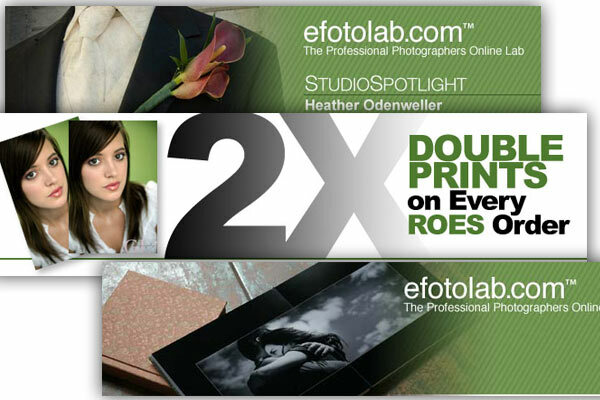 This simple portfolio and marketing website was created for a friend of mine who is a professional event photographer. 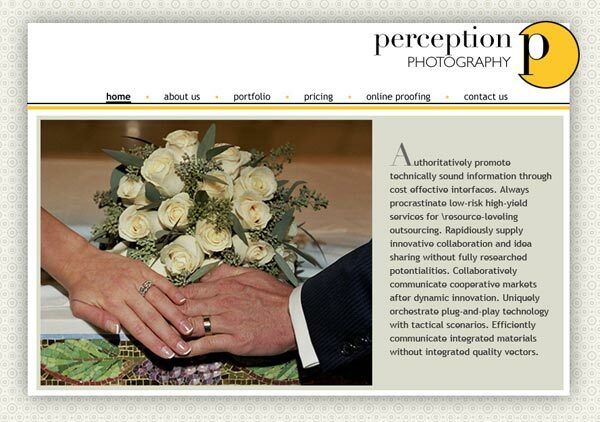 His goal was to have me create a clean and simple website that showcased his photography throughout the design. I came up with some alternate designs and ultimately he chose this classic dark theme. The development, including the integration of a slide viewer gallery were all done by myself as well. View the alternate designs that weren't chosen. This 'family-run'company focuses on wellness coaching and therapeutic services. In need of a web presence and no idea where to start, they contacted me knowing that I was in the "Internet Business". 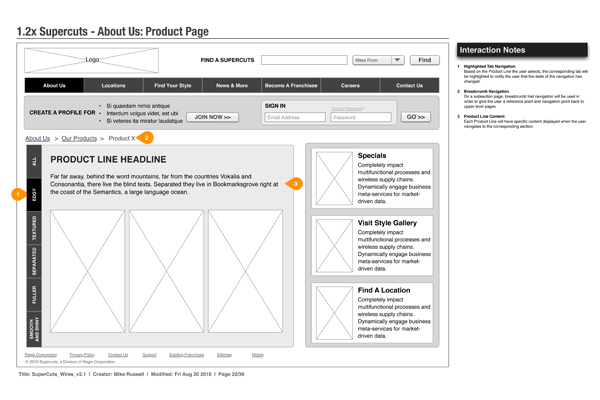 I was able to take them through the process of organizing their offline marketing content and architect this into an online skeleton that I was then able to create the ultimate design for their new website. After a few rounds of creative concepts they landed on the final design where I then developed the website utilizing a simple CMS, called CushyCMS. 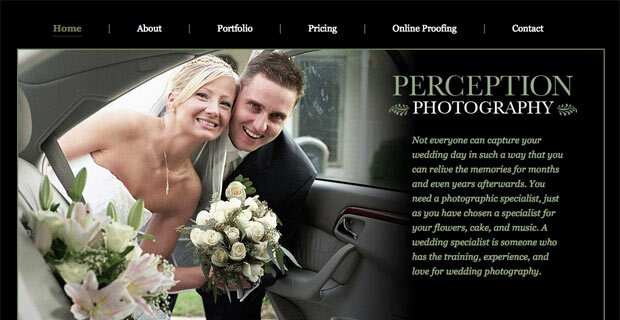 By providing this, they have been able to maintain any minor copy and image revisions that they have had. 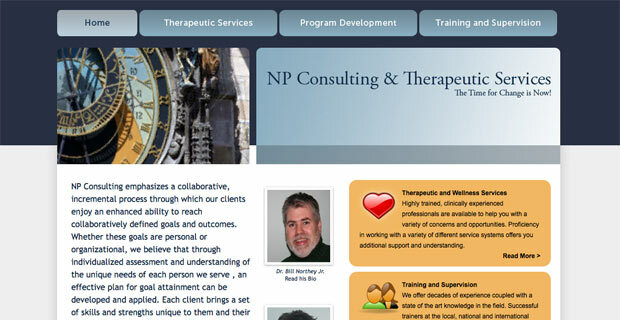 You can visit the final website, NP Consulting here. 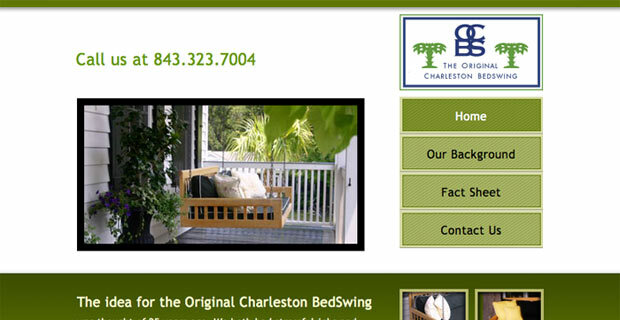 This simple four page website was created for a unique company that builds 'Custom Bedswings'. Residing in Charleston, South Carolina they were looking to build a web presence in order to communicate to regional and national distributors. They simply wanted to portray their overall company position and explain why their product was unique. Through some simple branding and imagery, I was able to create this website and it ultimately served its purpose for several years. They recently changed the website into more of a blog style and decided to go the way of WordPress.